This year sure has been a wild one. It included my cookbook launch along with some serious overseas adventures in Bali and Dubai. Bali was honestly one of the most beautiful places I have ever experienced and to be honest, I haven't even begun to explore all it has to offer and I can guarantee that I will return to this little slice of heaven! The people are humble and kind and the environment thick, lush and tropical with warm balmy air. And don’t get me started on the spectacular food! As you can well imagine I ate my way through Bali one glorious cafe at a time. With most of the island being vegan and offering up healthy snacks and treats I felt like free-reign was essential to getting the full experience. So here is one of the first blog posts from my trip and a little information on where you can go feast while soaking in the good vibrations of Bali. We flew into Denpasar airport and took a cab (which should cost you no more than R250) straight through to Canngu. Canggu is a little surfers village on the west coast of Bali. Filled with gorgeous cafes that have well thought out interior and more often than not an extensive healthy menu that is made up of fresh colourful foods and smoothies. Be patient in the cab on the way from the airport as traffic is crazy and although the journey isn’t far it can take over an hour to get there as the roads are small in Bali. If you are traveling on a budget I would say that the cafes are very well priced. You can get a meal for R80 ($6) however, if you want to change it up and go to a local warung which is a home restaurant run by the locals then you can get an amazing fresh meal for R20 - R50 ($3) Do make sure you experience a Warung as the food is fresh and delicious and you are supporting local which is always wonderful! In no specific order here are the cafes I visited and loved! This little hipster cafe was my welcome to Bali spot. It has a simple industrial concrete decor with a menu that offers a wide variety of healthy smoothies, smoothie bowls and hearty dishes such as fluffy quinoa and perfect poached eggs. It fills up quickly so I would visit earlier in the day if you want to get a space. You order at the counter and most meals cost roughly R50. Which was brilliant value for money and some would argue the best breakfast in Canggu. The food was fresh and tasty. You can also order coconuts everywhere you go so make sure to try them. They are great for hydration and taste like heaven! The coffee was on point but don’t take my word for it! Make sure you pop around to this institution. I mean who doesn’t love avocados toast? If you do then I have found your mecca. This little spot has a full menu designed around the glorious food that is avocado! With Avocado roses coming out of the kitchen on all dishes it was easy to fall in love with the food before we even ate it! A little more pricer than most cafes for breakfast however, if you have the spend in your budget then dig in and enjoy! The dishes are served on white plates making each one pop with colour! Not to mention the avocado toast was heavenly and combined with fresh elements such as sugar snaps. Yum! The branded coconuts didn’t go a miss either, its all in the detail. Made famous on Instagram Nalu Bowls is a little cafe situated not 500m from the beach front of Canggu. 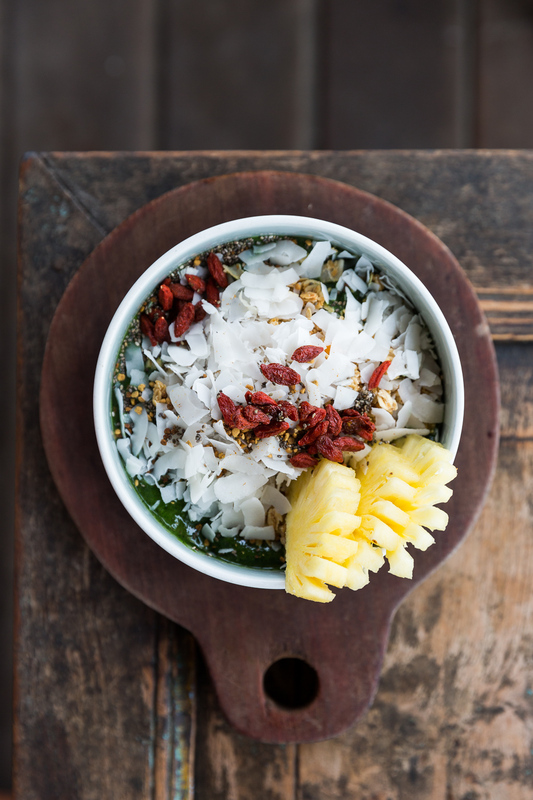 If you find them on instagram you will get lost in the world of perfect smoothie bowls that are so beautiful you won’t want to eat them. Unless you are me. They are filled with fresh fruits and made fresh to order. The wait can take long so get there before you are hangry, it is well worth it! Catch a bite at the local Warung. These are spots that have been set up in the front of a local families house. The kitchen is at the back and they have turned it into a family business. The offer a wide variety of fresh vegetables, noodles and of course rice. Try the red rice as this was my favourite and I am convinced a meal on its own. Nasi-goreng (fried rice) and Mie-Goreng (fried Noodles) are the famous local dishes and you have to try them to experience authentic food. This was our favourite way of eating as it was super affordable, you get a large variety and it is freshly made every day! Plus you are supporting local families. Ok so get ready to have the worlds best chocolate smoothie - yes I said it. It was simply mind blowing delicious and the best part? It had natural probiotics in it. So not only will you fill you belly with happy flora but you will send your taste buds into chocolate heaven. The rest of the food is just as utterly scrumptious and is completely vegetarian and healthy. They make yummy smoothie bowls however I dug deep into their full house style breakfasts with eggs. They also stock Ubud RAW which is a chocolate brand making healthy chocolate treats with local organic cacao. Whats not to love? Rise and Shine was my standard go to veggie breakfast bowl with delicious sourdough toast topped with avo! A utterly delicious carefully made breakfast that was well thought out and very filling. Space is limited so make sure you get there early or be ready to wait for a table as it is very popular. They also offer coffee that was sublime. I might or might not have lost myself in several coconut milk piccolos for the morning. Resulting in Lauren needing to keep up with my Caffeine high! This Vegan emporium will leave you mind blown at what you can achieve sans meat. Meet Peloton Supershop. A cafe that offers a full vegan experience from burgers to tacos and non of it will make you long for their meat counter part. Coupled with a bicycle store this spot is all about the environment which means I am all about it. The menu is extensive and you will find something for every occasion. The menu was created together with Indonesian/Australian vegan and foodie Lauren Camilleri. The food is colourful and the hardest part is deciding on one dish. Which I couldn’t do so I ordered 3. It’s a problem! A must visit vegan or not! The interior is industrial meets vintage and the staff are always happy to help! Cafe Vida - Im not sure what I was more in love with, the extensive list of healthy elixirs or the wide variety of chocolate and sweet treats that were made from raw healthy chocolate. This establishment is housed inside a balinese authentic home and is filled with the smell of coffee and you can soak up the culture while you feast. The smoothie bowls were my favourite in Canggu. Topped with bee pollen and seed mix they were perfectly balanced in their fruit to super food ratio. The menu is well thought out and offers one of the widest varieties of herbal tea I have seen! It was so good, I went back twice! Canggu is filled with hip and happening cafes around every busy or quiet corner. I only got to small handful and wish I got to so much more. The one thing I do know is that this little surfing village prides itself on the quality of the cafes and you can’t really go wrong because exploring is part of the adventure. If you find yourself in Bali, be brave, take a shot left and try something new. You will most probably fall in love with it. This list is just my experience and I hope you will go out there and make your own!